What is the Best Chainsaw Sharpener for the Money? A full chisel chain has what are called “square-cornered teeth.” These easily cut through wood fibers and are mostly used to cut softwood. There is more risk of these chains kicking back. One of the reasons for this is because they are sensitive to dirt. These types of chains are generally found on professional and semi-professional saws. A semi-chisel chain has teeth which are rounded instead of square. These chains are slower at cutting through softwoods, but they do stay sharper for longer. This is why they are often chosen for wood which is harder or dirtier. Semi-chisel chains have a lower risk of a kickback than your full chisels. Chipper chains aren’t dissimilar to semi-chisel. The main difference is the radius on the “working corner.” The working corner is the part which cuts the wood. In chipper chains, the radius of this section is larger. You may also see low profile chains. These have rounded edges and grind profiles. They are popular and are fitted to a lot of consumer models. The often need less power to be operated and aren’t as sensitive to dirt as other chains. They also have more safety elements on the chains, so you can understand why they are used by more inexperienced users. However, they do need to be sharpened more often. There are a few different chain arrangements you might see. These are; full complement chains, skip chains and semi-skip chains. Just from the names, you can probably already imagine the differences. The full complement chains have the most teeth and skip chains have the least teeth. It goes without saying that the semi-skip is somewhere in between the two. If you use your chainsaw often, it might be worth learning how to sharpen it yourself. Trips to go and get it sharpened can be long winded and a bit of a burden. They can also cost you a tonne of money, especially if you need your chain sharpened often. If you learn how to do it yourself, you can save time, effort and money. Make sure you are using the right file size. The manufacturer will tell you which size you need. Using the incorrect file size can result in you not sharpening the teeth effectively. If you use one which is too big, you will end up squashing out the teeth and filing of the points. If you use one which is too small, you won’t be able to sharpen the teeth at all. Start at the unique link. On each chain, there will be a link that looks a little different from the others. It won’t have any teeth on it and on the best chainsaw chains it will be a different color from the others. It will stand out and be easy to see in comparison to the others. This is a great way of being able to tell that you have sharpened the whole thing. If you start there and finish there, you will know you have done the whole thing. Keep the pressure even. Keeping the pressure the same all the way along will ensure the teeth are evenly sharpened. You don’t need to apply loads of pressure to get the tooth sharp, but it does need to be even. Now you know how to get the best results when sharpening your chain, let’s take a look at the best tools for the job. These are the top options out there at the moment, you will have no trouble getting the best results with these three sharpeners. This product is in the running for the best chainsaw sharpener without a doubt. It files and sharpens both the cutter and the depth gauge simultaneously. This is a 3/16 inch file, so check and make sure this is the right size for your blade before you get cracking. It gets great reviews online, and this sharpener seems to do no wrong in the eyes of the reviewers! Some have found it difficult with sharpeners which don’t sharpen both the cutters and depth gauges at the same time. This takes all that difficulty away by doing them both at the same time, saving you a load of time and effort. Once you get used to doing it yourself, it shouldn’t take you long to sharpen everything up. After a bit of practice, you will be doing this in a matter of minutes. 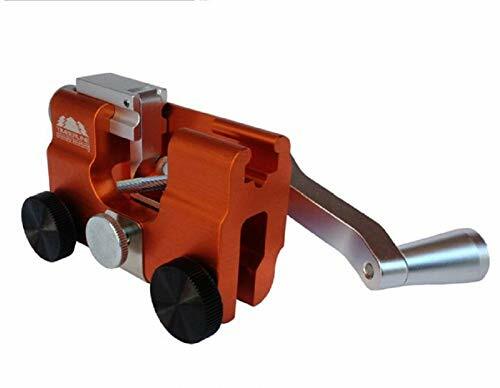 If you want a good, reliable product, this chain sharpener gets top reviews, and there’s hardly a wrong word to be said about it. It’s a relatively cheap option, which allows you to sharpen your chain by hand manually. This is equipped with a top plate and down angle settings. It also comes with a dressing brick, three grinding wheels and a quick check grinding template. It also features a built-in light so you can see exactly what you are doing with ease. It can either be mounted on a bench, or on the wall to enable the safe and practical use of the machine. There are only a couple of steps to the installation, so it shouldn’t be too long before you are up and running. Some have found it a little tricky to get it set up correctly. Perhaps make sure you bring a little patience with you to your workstation when you are going to get this set up. 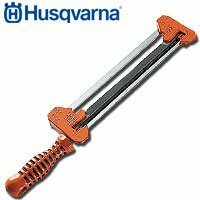 If you make use of chainsaws with different sizes or types of chains, this will be a great option for you. It enables you to easily switch to the correct choice for the job. There is a small amount of assembly required for this product. If you have been hand sharpening your blades, this option should do a much better job. If you are sharpening frequently, it should also save you a load of time when it comes to sharpening to the highest level. If you are new to DIY sharpening, you might need some time to get to grips with this and get the hang of it. This Timberline chainsaw sharpener is another relatively pricey option, but that is what you get when you want the job done fast and effectively. Some may balk at what seems to be a pretty steep price, but, this product gets the job done. It gets the job done well and is easy to use, and it gets excellent reviews online. It sharpens each tooth in a matter of seconds, and it ensures that each tooth is sharpened at the same angle and to the same length. Unlike the Oregon, it is portable, so you can take it with you and use it at any time. Even if you have no sharpening skills, you can use this chainsaw sharpener and achieve great results. This will inevitably reduce the amount of time you are spending on sharpening if you are doing it entirely by hand. And, over time, this will end up saving you money in comparison to paying to get your chain sharpened in a shop at a substantial cost. Consider whether you are looking to save time, save money, or both. 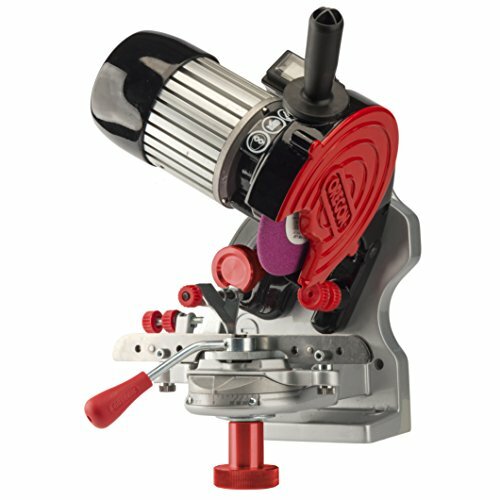 Whichever option you go for, make sure you are selecting a sharpener which is appropriate for your chain.